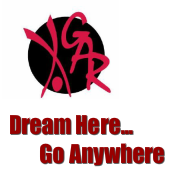 2018-19 Competitions - See it, do it, nail it... WE ARE GAR!! For all meets other than our own, be at the meet 1 hour before your scheduled start time. Hair tightly and neatly pulled back with no fly aways. (no bobby pins or braids). Barrettes must be the same color as your hair. You need a red bun cover and a black scrunchie. No bra straps showing unless it is beige colored. No nail polish or jewelry of any kind. Use the bathroom before competing. Socks for trampoline and double mini must be solid white with no markings. No warm ups allowed on the meet floor. No warm ups allowed during awards. Trampoline: solid black with no markings. Double Mini: solid white with no markings. If your athlete does not wish to eat in the morning, that's OK! they may have a nervous stomach and will eat later. No flash photography during meets. Have fun watching your child shine! No parents are allowed on the meeting floor unless they are volunteering. If your athlete has multiple events close together, do not go to awards directly after your first event is finished. The flight for your child's next event will not wait for them to receive their awards. If your athlete has two events at the same time, please let the coaches know so they can give the athlete direction.